AllTrac.net • View topic - CT26 compressor wheel upgrade worthwhile? Re: CT26 compressor wheel upgrade worthwhile? Any updates on this yet? Got her up and running? Yea she's running and driving daily. Just never finished the thread. celica_gtx wrote: Yea she's running and driving daily. Just never finished the thread. Was wondering more of what kind of #'s your pushing. If there decent I would def pay 200 bucks. The CT26 is a viable option up to about 325hp. There's an inherent design flaw in that the turbo is inverted, forcing the oil to flow upwards, opposite of gravity. That's the prime reason for it's limitations. Having said that, I upgraded one of mine at Turbonetics in CA, way back when they did "hybrid" upgrades. They don't do them anymore. They installed a Garrett T-04 H3 compressor wheel, 360 degree bearing and machined the compressor housing for about $300. There was increased boost pressure with drastically less turbo lag. Response time was cut in half, making the car a blast to drive! The CEL ended the fun when it sensed the overboost situation and sent the car into "limp home" mode. Simple fix with the resistor in the ECU. Overall, it was an economy upgrade with very pleasant results! 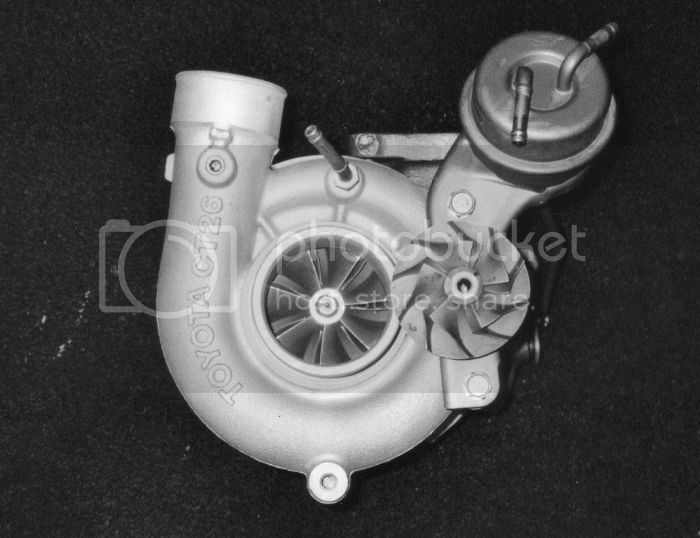 But again, the design of the turbo limits maximum performance. I have a picture around here somewhere if I can find it. Yea like I said I had throwen in stuff w the deal I think that what I originally got quoted aswell showing up to the door step w cash in hand is good too. I cranked it up to 14 the other day n its a blast. But u can tell it'll be more fun w supporting mods n a tune. There is a compresssor map on their page but other than that I'm not to sureim sure it can relate to ats ct27. But I can me wrong.. If you do the upgrade, there is no reason to go with a compressor wheel larger than a TO4E-46 trim compressor wheel. Also, perform a 15 degree clip on the turbine wheel. The clip will allow you to run higher boost without it falling off until ~6000rpm which has been dyno proven to add ~ 15hp. If you didn't build it, it ain't yours.